Ok, I must explain something: personally, I have nothing against bands that are prowling into the past, searching for a Holy Grail that can make time goes backwards back to the 70’s, 80’s or even further into the past. My main problem with that is: what was done is already done, and focusing your energies to play what I (and many others) have heard time and time again is a loss of time if you lack of personality. Although originality is not the main intention of the Finnish quintet RHINO PROOF, I’ll not deny it: they are pretty good, as their first album, “Rhino Proof”, is here to proove. As I wrote above, you won’t find anything new on this album. It’s just a very good Classic Rock/Hard Rock album in the same vein of those names from the 70’s. But if it lacks of originality, we can’t deny that they have personality enough to breathe new life on the genre. A very good instrumental basis along with charming vocals, with songs that are easy to understand and sing along, is more than we all can resist. The production of “Rhino Proof” can be said as a great vision of the band. They aren’t trying to sound moldy and smoky as those old records of the past, but with a modern clarity that allows their melodies to grow and catch us all by our ears. Yes, the producer of the album surely made a great work. On their eleven Classical Rock themes, I must state that the longer you hear the album, the more the band will seduce you. But the very good melodies of “Code of the Road”, the Hard Rock scent and fine organ parts of “Lucky Me”, the beautiful chords and vocals of “Anchorage” (this vocalist has a tender and great voice, indeed), the tender and heavy feeling of “Gravity”, the Hard Rock in DIAMOND HEAD’s way shown on “That’s the Way It Goes”, and the introspective “Worth of Nothing” with its Country Rock influences will hook to you in a way that you’ll hear this album time and time again. 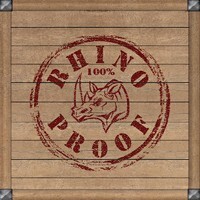 Nothing new at all, but these guys have guts and play a charming music, so hear “Rhino Proof” and get hooked!